Forbes has published its annual list of World’s Richest people. 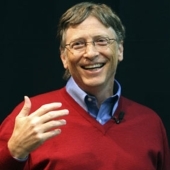 Bill Gates lost $18 billion but regained his title as the world’s richest man. Warren Buffett, last year’s No. 1, saw his fortune decline $25 billion as shares of Berkshire Hathaway (nyse: BRK.A – news – people ) fell nearly 50% in 12 months, but he still managed to slip just one spot to No. 2. Mexican telecom titan Carlos Slim Helú also lost $25 billion and dropped one spot to No. 3.